Bus bridge between Baypointe and Civic Center stations, serving all light rail stations in between. Santa Teresa to Alum Rock light rail service will be operating on a regular schedule. Ambassadors will be available at Baypointe and Civic Center to guide passengers. Northbound: Light rail service will operate between Santa Teresa and Civic Center. Passengers traveling beyond this point will take the bus bridge as far as Baypointe station and reconnect with light rail toward Alum Rock to your destination. Alum Rock, and Mountain View trains will be combined to form a single through route. Southbound: Light rail service will operate from Alum Rock to Baypointe station. Passengers traveling beyond this point will take the bus bridge as far as Civic Center station and reconnect with light rail toward Santa Teresa to your destination. Northbound: Light rail service will operate between Winchester and Civic Center. Passengers traveling beyond this point will take the bus bridge as far as Baypointe station and reconnect with light rail toward Downtown Mountain View. Southbound: North of Tasman station, Alum Rock, and Mountain View trains will be combined to form a single through route between Alum Rock and Mountain View stations, bypassing Tasman Station. Passengers traveling to Tasman and south will take the bus bridge as far as Civic Center station and reconnect with light rail toward Winchester or Santa Teresa to your destination. 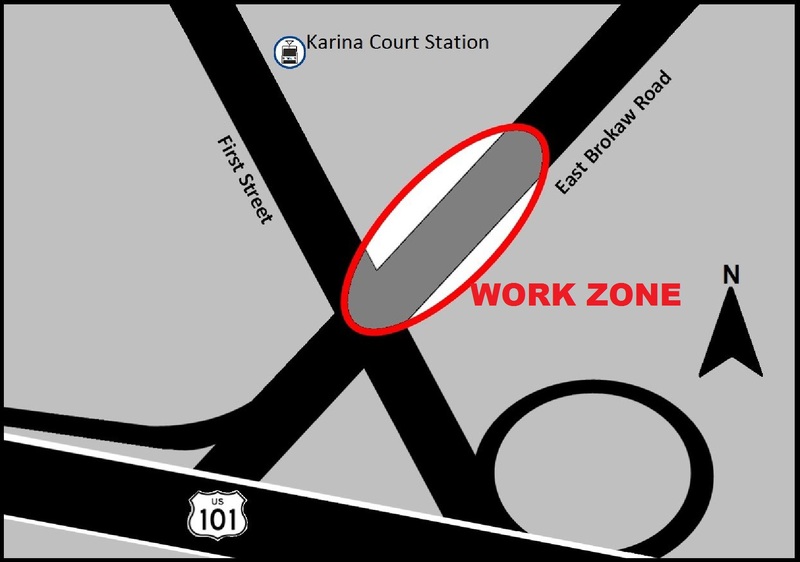 VTA will be replacing track around East Brokaw Road and First Street near the Karina station which will require a light rail shutdown in the area. Construction will occur Friday, March 2, 2018, at 9:00 AM through Monday, March 5, 2018, at 4:00 AM. Weather, scheduling, and conditions permitting. Rail construction involving noise, lights, and construction vehicles driving forward and in reverse with accompanying beeping sound required for safety. Why so many scheduled track repairs?